Ring Rust Radio had former Ring of Honor and Current TNA superstar KENNY KING on the show this week, and it was a great episode with plenty of exclusive content. Ring Rust Radio: Impact Wrestling made the move to Wednesday nights starting last week and can be seen every Wednesday at 9 p.m. ET. While you are one of the best parts of the show each week, the decision was made for you to drop the X-Division Championship. 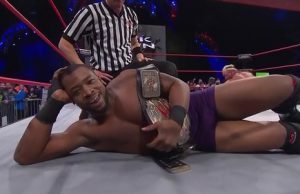 What do you think about TNA’s move to Wednesdays and when can the fans expect to have Kenny King holding gold again? Kenny King: Well I think Wednesday nights are a good night for wrestling now with everything going on. Now we have Impact and Ring of Honor, and that gives you three hours of wrestling you actually want to watch. As far as getting my belt back, this Wednesday at Destination X, I get my shot and we will see what happens. RRR: Right now, it seems like every wrestling fan is talking about Ring of Honor’s move to Destination America as a lead-in for Impact Wrestling, and there’s a lot of differing opinions about what it means for both companies. Firstly, what was your reaction when the ROH was initially announced? How surprised were you? And also, do you view it as a positive or negative situation from TNA’s perspective? King: I’m a pro-wrestler and that’s how I make my money and I am also a fan of the wrestling business. Ring of Honor being viewed as being good enough to share the national spotlight with another company that’s really good for wrestling. It’s not a product that I’m unfamiliar with and the quality is unquestionable – it’s Ring of Honor. It’s hard to see it as a negative when it means there’s more places for guys to work and get exposure for guys that are really good. RRR: You’ve been one of the most consistent and entertaining wrestlers not just in TNA, but in the industry for the past couple of years. We’ve been calling for you to join the World Championship scene for many months now, but you’ve been on the outside looking in. Is there anything in particular you think is holding you back from breaking through the glass ceiling? King: I think it comes down to timing and everything has to be right. I am my number one fan and I would have told you that I’m ready for a title shot that day, but it might not have been the right timing. Whenever it is my time I grab it and I run with it. The thing you can say about TNA is it’s not the old guard anymore. The push to the top is there for guys who are ready and able to do it versus just name recognition. RRR: There was some controversy surrounding your move from Ring of Honor to TNA. Looking back now, you made the right decision jumping to Impact Wrestling. What was your thought process making the transition and are there any hard feelings left between you and Ring of Honor? King: The reason it got blown out of proportion was because of one person who took it personally. I never, ever treated Ring of Honor any negative way. The people that matter then and do matter now in Ring of Honor I have nothing but love for ‘em. I still love that company and have nothing against Ring of Honor at all. RRR: One of the biggest reasons why TNA became so popular initially was the fact that it set itself apart from other promotions with the X-Division. I think most would probably agree that the X-Division has had its ups and downs in recent years in terms of how much emphasis TNA’s place on it. How would you describe the current state of the X-Division, and what do you think can or should be done to improve it? King: Well, there’s times when the division takes the forefront and then there’s times when the guys stories can go slow. It’s kinda of one of those things where you look at the original logo for TNA is built on the X division. It’s one of the reasons TNA’s identity is tied with the X division. The fact that any given day you can put X division guys, any two of us, and give us 15-20 minutes you will get a main event quality match. That’s a testament to how strong it is and that it will always be there. Destination X is always a good time of year because it reminds everyone that we are amongst the best in the world in that style. RRR: Last year, you took your character into a new direction with the King of the Night moniker. I think a lot of people to say the past year has been some of the best work of your career. What goes into the decision to change your character? How do you know when the time is right and how much planning is involved to switch things up? King: Funny thing is I wanted to come into Impact Wrestling with that King of the Knight gimmick. They didn’t think it was right at that time and said I could pull it out later. Hopefully King of the Night is a way to reintroduce me back to the fans. The direction that it took organically with Bobby Lashley and myself showed why the gimmick worked. RRR: You were one of the finalists on the second season of WWE’s Tough Enough. With the return of that program, what did that experience teach you and would you like to see TNA do something along those lines, possibly an American version of British Boot Camp? King: I was just gonna say don’t sleep on British Boot Camp now. Tough Enough was my entrance into professional wrestling and it’s really what made me love it and want to stay. I think it’s a great opportunity for wrestlers and to help get eyes looking at you. It gives you’re the opportunity to start in the middle versus to where guys start at the very end. I would love to see a Boot Camp version of that and get some trainers on there with some experience. RRR: Most fans know that you got your start in wrestling as part of Tough Enough, but you also underwent some additional training after that and one of your trainers was former AWA world champion Nick Bockwinkel. What were your interactions like with him and what are some things you might have learned from him that you’ve implemented into your game over the years? King: I can tell you this, it’s a compliment saying some of my work this year is my best ever and that is a testament to Nick Bockwinkel. Nick would come in on Thursday nights, sometimes Fridays, and we would work on promos and learning and understanding your character. You would cut your promo, Nick would watch it, then he would tell you it sucked. After that you would do it again, and again, until it was right. He really was all about practice makes perfect. I don’t know where I would be without Nick Bockwinkel.